Missions for Mars: What's for Dinner? When NASA sends humans to Mars, it will have to overcome not only engineering challenges, but gustatory ones as well. 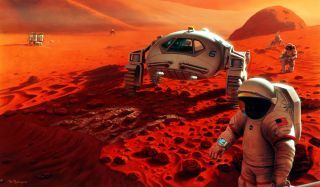 In fact, providing a full, nutritious and varied diet for future Red Planet travelers could be one of the most difficult aspects of planning the trip, one NASA researcher said. Future Mars explorers will likely have to grow some of their own food, and be much more involved in food preparation than astronauts on the International Space Station, said Maya R. Cooper, a senior research scientist at the Space Food Systems Laboratory at NASA's Johnson Space Center in Houston. Cooper presented her findings at the 242nd National Meeting & Exposition of the American Chemical Society in Denver on Aug. 28. "That's a clear impediment to a lot of mission scenarios," Cooper said in a statement. "We need new approaches." One possible solution is to fly a self-contained "bioregenerative system" to grow food during the trip to Mars. Plants in such a system would multitask, providing food and also serving as little oxygen factories, producing fresh air for the astronauts to breathe. The plants would also clean the air of carbon dioxide exhaled by crews, and could even purify water. Plants selected to be grown in space would have to meet a number of qualifications. For one, they would need to have few inedible parts that would be wasted. They should also be hardy, compact, and able to grow with minimal tending. NASA scientists have identified 10 candidate crops that seem to fit the bill for astronaut food: lettuce, spinach, carrots, tomatoes, green onions, radishes, bell peppers, strawberries, fresh herbs and cabbages. Still, it won't hurt for future astronauts to have green thumbs. "This scenario involves much more food processing and meal preparation than the current food system developed for the space shuttles and the International Space Station," Cooper said. NASA researchers are also considering shipping some bulk commodities to Mars on a separate unmanned spacecraft ahead of the astronauts. The first of these missions could launch in the 2030s, a year or two before crews launch, to build up a cache of food that would be ready and waiting when the astronauts arrive on Mars.